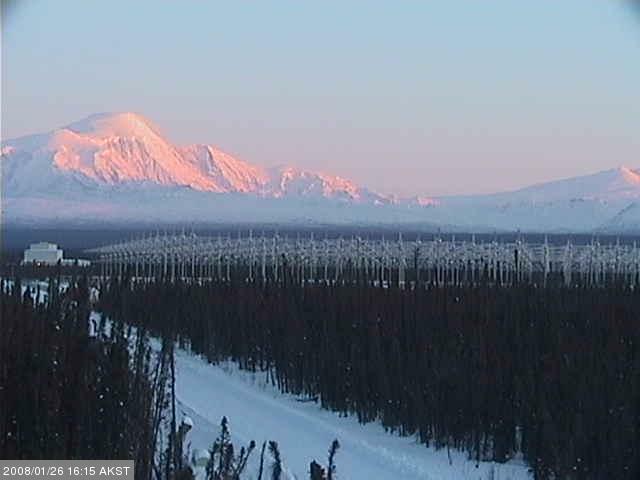 HAARP Facility in the Gakona region of Alaska. Recently, the "High Frequency Active Auroral Research Program" (known familiarly as "HAARP") conducted an interesting test of their multi-megawatt transmitters and zenith-oriented directional antenna system. The test involved bouncing signals off the moon and testing the receive capability of casual shortwave listeners around the world. Technical people at the facility had determined that reception of the echo should be possible when the moon is in the transmit pattern of their antenna. In addition, the moon would be directly overhead for most of the U. S. receiving stations at the time of transmission which would minimize ionospheric attenuation at the low 7 MHz. frequencies. The tests were conducted on two nights, January 19 and January 20, 2008. One hour of transmission in a "two-seconds-on, three-seconds-off" format would occur on each of two frequencies in the forty meter wavelength region for a total of two hours of tests each night. During the first hour the transmitters would be operated on 6.7925 MHz. and the second on 7.4075 MHz. plus or minus any existing signals. My regular amateur radio station is in a building separate from the house and consists of a Kenwood TS-940S and a 135 foot dipole oriented broadside east-west with the center at about 50 feet and fed thru open-wire transmission line and impedance matching tuner. I also listened part of the time using my standby station in the house which is an ICOM 728 transceiver and 40/20 meter dual-band dipole broadside north-south. Recordings were made with a battery-operated cassette recorder of unknown vintage. The HAARP transmissions were initially very strong indicating a 40 db over S-9 signal on the Kenwood receiver during the first hour on January 19, 2008. Once I got the receiver set up properly with the bandwidth optimized, I began to hear echoes from the moon in the three second window after the two second pulses. There was virtually no doppler shift and the signals were barely audible much of the time, rising somewhat above the noise level at times. I listened for the last few minutes on the ICOM radio in the house and the echoes were heard a little better. This may have been due to slightly lower background noise or perhaps some advantage gained by using a lower antenna which would tend to enhance the vertical pattern. After the first hour, the transmissions were shifted to a slightly higher frequency (7.4075 MHz.) Reception of the HAARP terrestial signal was down in strength by 20-30 db plus there were some interfering signals, probably spurs from nearby foreign broadcast stations, which masked the weaker echoes. While I heard echoes from both receiving locations, they weren't as noticeable as in the previous hour. Recording from January 19, 2008 on 6.7925 MHz. with strong echo returns.